Outrageous is the seventh level in the Special Zone of Super Mario World. The level takes place in a wide forest, probably in autumn since the leaves of the trees are brown. Outrageous consists of one long screen which the player has 300 seconds on the Timer to complete. This level has five Dragon Coins in it. The whole level is crowded with Wigglers, Jumping Piranha Plants, and Amazing Flyin' Hammer Brothers. There are also numerous Turtle Cannons that keep shooting Bullet Bills to block Mario or Luigi's jumps. Fire Snakes are also present. The entire level can be flown through if the player has a cape. Otherwise, the player will have to first navigate through a mess of Turtle Cannons, Jumping Boards, many different enemies, and a few Blocks. Thankfully, there is a ? Block that contains either a Super Mushroom or Fire Flower, depending on Mario or Luigi's state. This segment of the level comes to an end once a tall orange Warp Pipe comes into view. 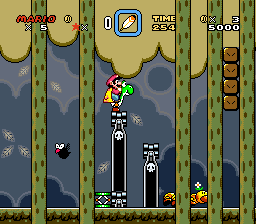 From that point on, the player will have to deal with Amazing Flyin' Hammer Brothers and Jumping Piranha Plants in between many gaps and tall pipes. In the middle of this segment, there is a ? Block containing Yoshi. Just before the Giant Gate, two more Blasters will appear below an Amazing Flyin' Hammer Brother. This page was last edited on April 6, 2019, at 00:07.